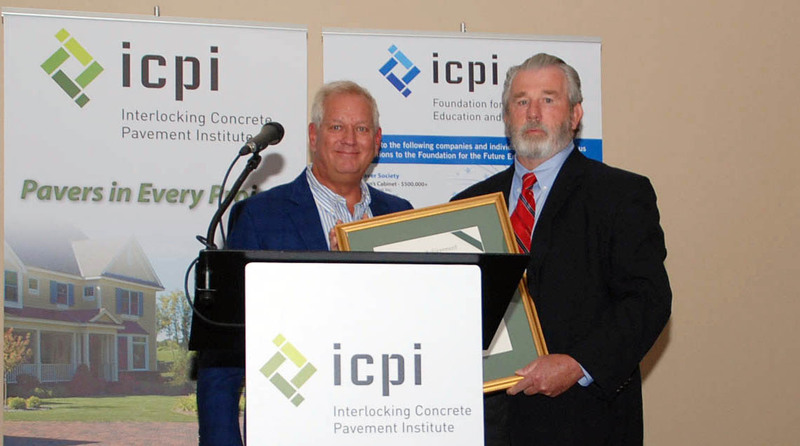 Chuck Taylor, widely recognized as one of the top experts in segmental concrete pavement systems in the United States, received the Interlocking Concrete Pavement Institute’s 2016 Lifetime Achievement Award at ICPI’s Summer Meeting in Nashville. Taylor, who currently serves as the National Hardscapes Advisor for Belgard, has more than 30 years of construction experience working at installation firms for segmental paver systems. His work during the last 20 years has focused on consulting with engineers, municipalities and stormwater designers on design, construction and maintenance of interlocking and permeable interlocking concrete pavement systems. Chuck Taylor receives the 2016 ICPI Lifetime Achievement Award from Steve Berry at ICPI's Summer Meeting in Nashville, Tenn. Some of Taylor’s most notable projects include the Port of New Orleans; Port of Oakland; Indianapolis Cultural Trail; the Morton Arboretum in Lisle, Ill.; Henley Station in Murfreesboro, Tenn.; Toyota of Vancouver; Cermak Avenue in Chicago; streets in Lafayette, Ind. ; the Southeast Atlanta Green Infrastructure Initiative; and Bridgetower development in Meridian, Id. Taylor’s other significant contributions to the industry and ICPI include guiding the development of ASCE 58-10, a national design standard for interlocking concrete pavements that established a structural equivalency for concrete pavers with asphalt pavement for street applications. He also influenced the creation of the new national standard for utilizing paving slabs released earlier in 2016 called ASTM C1782 Standard Specification for Utility Segmental Concrete Paving Slabs. In addition, Taylor chaired the ICPI Construction Committee from 2012-2014 and served on the ICPI’s Contractor Education Subcommittee, helping create the current structure for organization’s education and installer certification programs. He also has been involved with university and agency research projects that investigated pollutant removal, infiltration, and flow studies that sparked state and local agency acceptance of and increased designer confidence in permeable interlocking concrete pavement.